Great Spirit Comic Books! This Sausage is the Best! When Les is More . . . I have always been attracted to oddball guitars, and have had a bunch of them. However, the three classic electric guitars– the Fender Stratocaster, the Fender Telecaster and the Gibson Les Paul– were ones I always passed up. Maybe it was because they were so frequently seen; I don’t know. These three icons of the guitar world were all developed between 1950 and 1954 and a lot of companies have either copied them outright or made their own variations of them. More on that in a second. In the last couple of years, as I amble into my dotage, I finally gave in and got a Stratocaster (though not a Fender; more on that in a second, too!) and a Tele (made by me from various old-timey Fender parts). The Telecaster is now my favorite electric. For those of you who don’t play guitar, there’s a big difference between acoustic and electric guitars; in my mind, they are two different instruments. I started on bass, coming to guitars as I did from playing a baritone sax, and then mainly played acoustic guitars. For some reason, guitar players develop an affliction called Guitar Acquisition Syndrome, or GAS. I try to ignore it, but seeing rows of Tolex guitar cases all over the house proves I came down with GAS a long time ago. I guess I still have it, though I try to keep it in check. 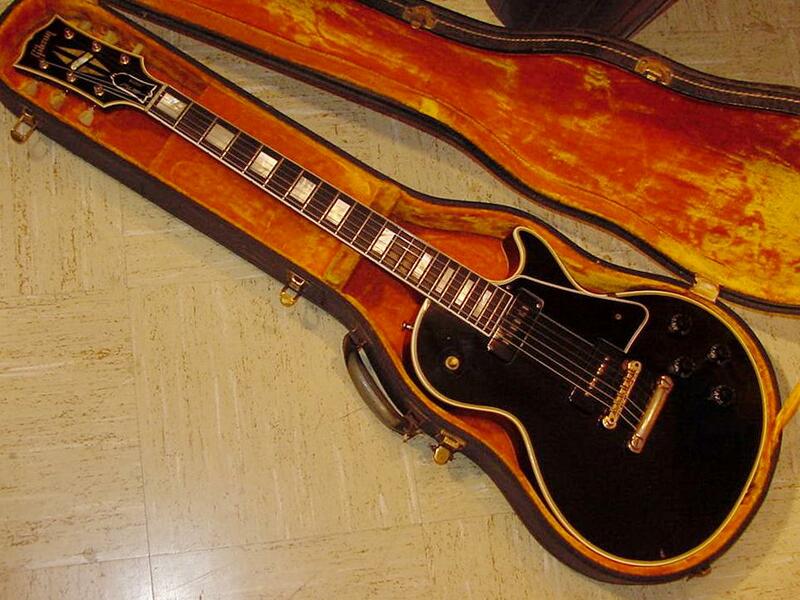 My latest GAS object of desire is a Les Paul, but not just any old Les Paul. The one I want is a type that Gibson made for only a few years: The Fretless Wonder Black Beauty model. 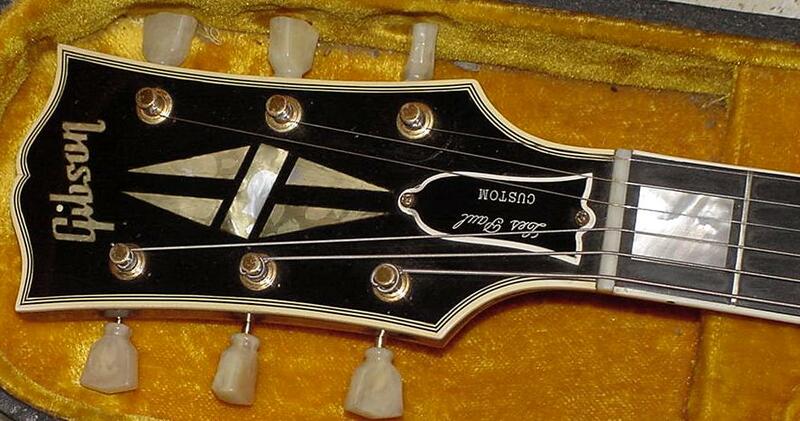 Its official designation is the Gibson Les Paul Custom, and it was originally made from 1954 to 1960. These originally sold for about $350 but command astonishing prices now– say $15K or so. I saw one for sale on the Net this morning for $37K. And most of the ones I’ve seen in person have been modified with taller frets. I play with a very light touch and the original flat, tiny frets would be perfect for my style of playing; most players today hate those kind of frets and have them changed to the more modern type. Since the original Fretless Wonders are so pricey, I looked into Gibson’s “Historic” and Vintage Old Stock reissues of those guitars. Even those are past the $3K mark; I’ve seen some selling for over $7K. Yeesh! Now Gibson Guitars realized several years ago that their prices for guitars built here in the U.S. and built using the original materials and finishes were beyond the reach of most players. And as the quality of the American-built Fenders and Gibsons declined– and they surely did when accountants controlled the companies–Tokai and a few other Japanese companies blueprinted the original classic guitars and painstakingly reproduced them by hand. Gibson and Fender both gave in and had their own Japanese contractors make guitars for them, and they are quite good. I have a Japanese Fender reissue of a 1951 Precision Bass that is a beautiful instrument. And the Stratocaster I got a year or so ago is one of the early-’80s Tokais and it is a spooky-good recreation of a two-color sunburst 1956 Strat– just like the ones Buddy Holly used to such good purpose. So I looked at the Tokai versions of the 1950s Les Paul Customs. They’re beautiful and exact copies of the Gibson Les Paul model I want, but even those are selling now for over well over $2K. 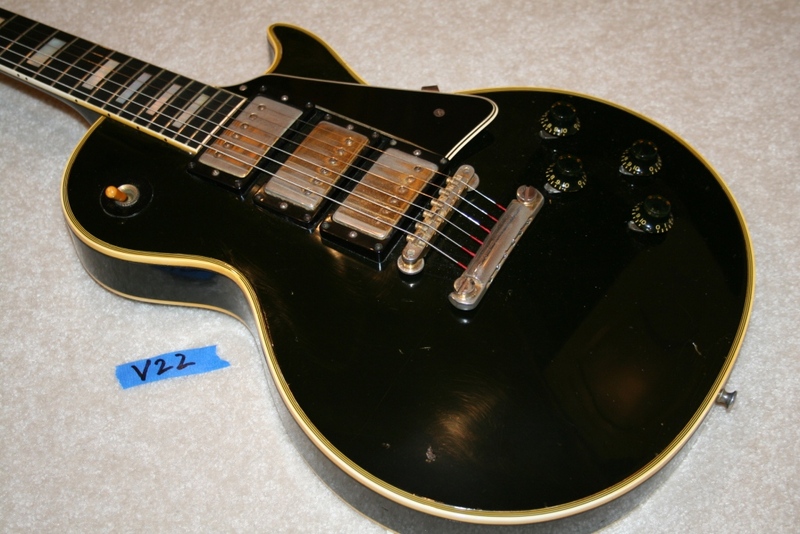 And, being a crazy GAS-afflicted guitar player, I wouldn’t be satisfied unless the Les Paul I got was one of the tiny-fretted, fat-necked gloss-black nitrocellulose-lacquer-finished Les Pauls! Really!!! So to heck with it. No Les for me. As I struggle to find a permanent day job in this frustrating economy it makes no sense to throw that kind of money at a guitar. Besides, Patty has learned to count those hardshell Tolex guitar cases and I am scared of her. But can you imagine how wonderful it would be to have a black Les Paul ’58 Custom that matches Murphy, my Boston terrier?!?!?! 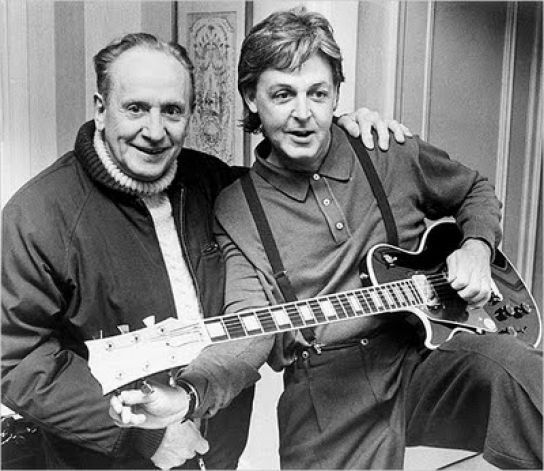 Les Paul presents Paul McCartney with a custom lefty Les Paul.